Rep. Douglas Ley, D- Jaffrey is pictured at left Wednesday in the House speaking about the lack of civility shown by some unnamed members. 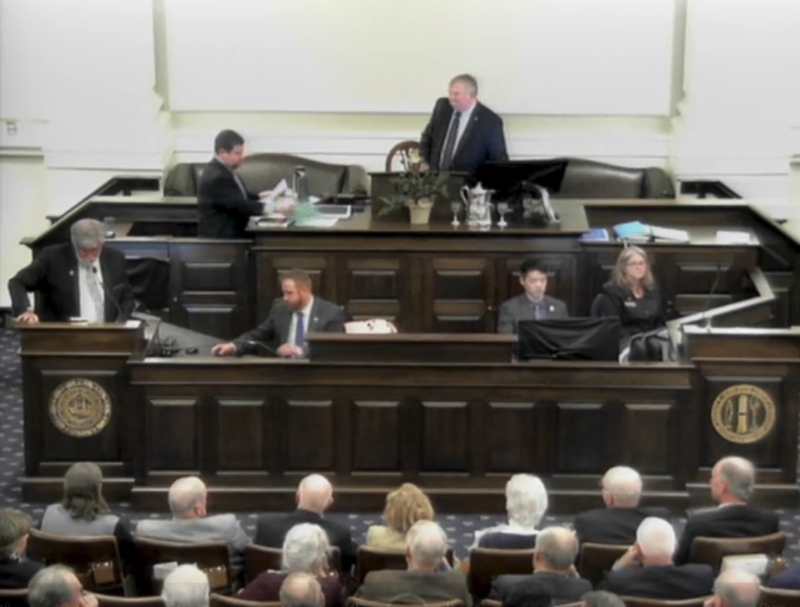 CONCORD – Rep. Douglas Ley, D-Jaffrey, called on his colleagues in the House of Representatives on Wednesday to follow the Golden Rule after detailing several instances of disrespect shown by some unnamed members to others. “I come to the podium with some degree of reluctance. And with a heavy heart in a way,” Ley said near the end of the session rising to speak under “unanimous consent.” He is the House Majority Leader. Ley said he has been proud to serve for seven years in the House, but was beginning to question that pride because of recent comments and actions. One member told another member, “Go back to Massachusetts with all the other Communists,” Ley said. Another told a member who served in the military that he was an embarrassment to the service, Ley said. And in another incident, Ley said one member aggressively pursued another from the parking garage to the State House insisting they converse even though one kept saying no. “Look, no means no,” Ley told the House. These were just informal comments, he said. “But is this what we really stand for? Is this what we’ve become? Does this in any way serve the cause of civility…,” Ley asked. 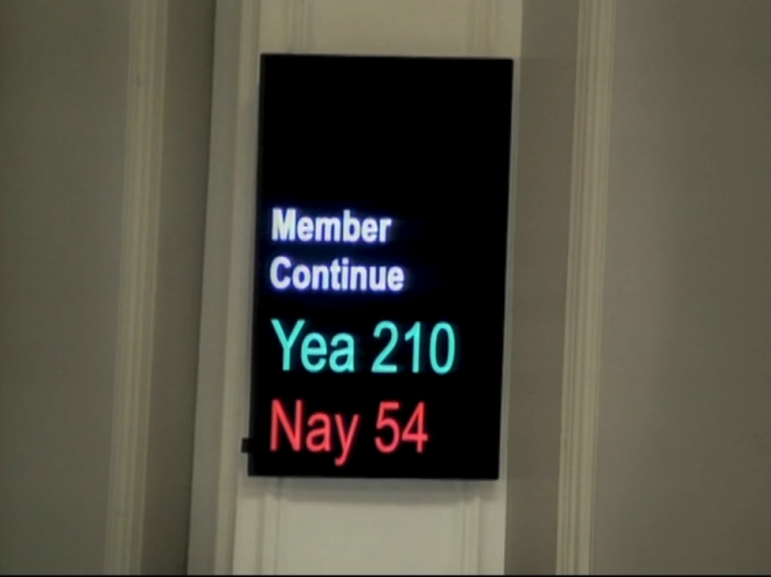 A vote taken to see if Rep. Ley would be allowed to continue speaking after one unnamed member objected to him rising to speak by unanimous consent. Ley said he didn’t intend to chastise any one in any caucus, that neither caucus is blameless if you take the long view. “Don’t wear the buttons, don’t wear the beads,” he said, referring to the controversy raised when some male members of the House Criminal Justice and Public Safety Committee wore fake pearls in support of the Women’s Defense League, during a hearing on the “red flag” bill. House Republican Leader Richard Hinch (R-Merrimack) released the following statement in response to Ley’s remarks. “I find it highly inappropriate that the House Majority Leader Douglas Ley took advantage of unanimous consent at the end of session to admonish and lecture the Republican caucus on decorum and behavior in and outside of the House. “He should stick to dealing with his own fractured caucus and leave Republican affairs to Republican leadership to address. If he has concerns about the behavior about some individuals there are more professional ways to go about resolving them. The Speaker should have never let his Majority Leader take this unprofessional and disrespectful route,” Hinch said. Ley was interrupted by an unnamed member who withdrew his consent and he was briefly stopped. The vote to allow him to continue was 210 to 54. Ley said he didn’t have much left to say when he returned to the podium. He ended with the Golden Rule. “Do unto others as you would have done unto you,” Ley said.